Add water to a small bowl and sprinkle the gelatin over the top. Let it rest for at least 10 minutes to allow the gelatin to absorb the water. In the meantime, add the almond milk, maple syrup and vanilla extract to a small saucepan on medium heat, stirring occasionally until the mixture starts to steam. Remove from heat. Add 1/4 cup of the almond milk mixture to the gelatin and whisk until the gelatin has dissolved, making sure there are no lumps. Pour the gelatin mixture into the saucepan and stir until well combined. 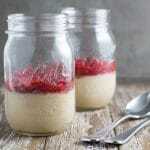 Pour into ramekins (or glasses or ball mason jars) and cool to room temperature. Then cover with cling wrap (or jar lids) and place in the fridge overnight (or minimum 6 hours to set). To make the strawberry + chia jam, add strawberries to a saucepan and heat for 5 minutes on low to soften them up. Add lemon juice and maple syrup and bring to the boil over medium heat. Boil for 15-20 minutes or until the mixture starts to thicken. Pour into a jar or container; add the chia seeds, stirring until well combined. Refrigerate overnight (or minimum 6 hours) to allow the chia seeds to gel. The cook time does not include the time it takes for the panna cotta to set in the refrigerator.